Today, Provost Davis and I shared details regarding the University’s most recent budget reduction efforts with the Faculty Senate. For transparency, we are sharing this same information with you at this time. This video message https://youtu.be/WRg0uglQl00 provides background on the work that’s been done over the last few months. In addition, the attached budget reduction summary shows where and how the Budget Reduction Team identified an additional $2 million, which can be accomplished without any layoffs. As always, should you have any questions on this or our ongoing efforts to navigate our evolving operational and funding models, please know that my door is always open. Thank you for your ongoing support during this transformational time. I am sure you have now seen the budget impact sheets released by UW System for each campus. You may find the one for UWGB at UWGB Budget Reduction Impact. This report was prepared at the direction of UW System to inform the Board of Regents, legislative colleagues and our community partners about the general effects of the budget reductions enacted by the legislature last year. The reductions listed on this sheet went into effect this past year. As we routinely argue, universities are integrated organizations and, thus, cuts in one area affect many other areas. The list of effects of these reductions reflect this integration. This sheet is not intended to be a detailed list of all reductions. Rather, it is designed to give the reader a clear impression of the overall effect of reducing the university budget by more than $2 M.
Our current expense reduction process is also noted on the summary sheet. The details of that additional $2 M reduction related to soft enrollment will be disseminated to the University community in the coming days as decisions are finalized. I continue to believe UWGB is in the best position possible to work through our current difficulties and expand our role in this community. However, please know that our Trustees and I continue to strongly urge policy makers not to apply additional reductions to the University in the coming biennium and to enter into a discussion about a rational tuition policy. I will share a copy of the Trustees’ statement in the near future. Thank you all for your great work and, most especially, for your commitment to our students and this community. UW System comprehensive universities prepared snapshots of budget reductions for the April 2016 Regents’ meeting. Although the budget discussions in the full board meeting were tabled, the documents are available for public viewing. You can see them here. 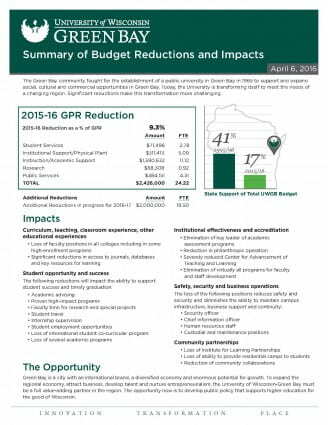 View UW-Green Bay’s Budget Reduction Impact Summary document (pdf). Slide 1 – Meeting the Urban Challenge: A New Comprehensive University Model for Green Bay. Welcome to the University of Wisconsin-Green Bay. It is a great honor to have you join us as we celebrate our 50th year. This is a very challenging time for the University. But it is also a very exciting time as we look to the next 50 years. One of the reasons we sought to have this meeting on campus this year is to give you an opportunity to learn about our vision for the future as we begin our next half century. With the help of a colleague, I want to tell you the story about an exciting university, born of the spirit of this community and in the process of reshaping itself for the future. I will tell you about a young university committed to transforming lives in a dynamic urban environment, creating solutions to social, environmental and economic challenges through innovation and a university committed to being a major partner in growing and nurturing the economy of this place, one of Wisconsin’s biggest economic sectors. We are doing this by redefining what a regional comprehensive university should be in this part of Wisconsin. When UWGB was founded in 1965, there was a strong sense in America of a deep commonwealth value of higher education. Despite their deep concern about introducing a Madison-like radical element in to the more conservative Green Bay, the founders of UWGB still believed that having a public university would bring substantial social and commercial benefits to the region. They envisioned a large university (20,000 students) that would serve the needs of the growing economy of this region. As you know, Americans generally no longer believe in the commonwealth value of public universities. The current view is that the main value of higher education accrues to the individual getting the degree. So, what we are doing at UWGB is essentially re-arguing the case for a comprehensive university in this region by reshaping ourselves to add value to the efforts of businesses and the community to address the real challenges of Northeast Wisconsin, the State of Wisconsin and beyond. And, we are doing this during a time of retrenchment and during a time of important changes in the contributions of key partners: the state and students. I could not be prouder of this University! Even as we take huge budget reductions we are thinking about the future. Because we believe that the economy of the third largest city in the state, a city with an international brand, and one of the largest economies of the state can only thrive in the way Wisconsin needs it to thrive with the University of Wisconsin-Green Bay as a full, value-adding partner in the social, cultural and economic life of this region. Show how our environment has changed in the 50 years since UWGB was founded. It is important to understand how this region has changed in order to appreciate the unique challenges and opportunities of UWGB. How we are responding to the strong forces of change in our environment. This will be the first opportunity since I became Chancellor for me to share our vision and strategy with you. I will also highlight the considerable assets we have to bring to bear on this challenge. In particular I will reaffirm one of the most important core values of the university: Our commitment to interdisciplinary as our educational paradigm. I want to emphasize that this core value is a key element to our new conception of the role of the comprehensive university in a changing urban environment. And, we believe the approach is particularly powerful in preparing students for the modern workforce. I want to give you a glimpse of the future by reminding you of how we have reorganized ourselves to add accountability and to align the University with the environment by highlighting one of the four new colleges which will begin operation on July 1. Circumstances tend to focus our attention on local challenge, particularly in the current instance, where we are all about cutting budgets. But all of us in higher education are buffeted by global forces of change that have direct and indirect effects on our environment. For UWGB, these forces have and continue to dramatically shape our environment even more strongly primarily because we are in a growing metropolitan area that is becoming increasingly internationalized and is faced with many of the challenges of modern urbanization. Indeed, we have come to think of this as the Urban Challenge and it is the focus of our strategy and our view of the future. Urbanization – We are beginning to see in Green Bay all of the dynamics of the global urban inversion with its complicated dynamics of the collision of inner city gentrification and poverty and the transformations of surrounding suburbs. Demographic shifts – These are not only the decline in the number of traditional college-aged students in the region but, importantly, also include significant changes in the racial and economic diversity of the region. Technology (affecting learning and commerce) – There are at least two dimensions to this force of change. The need to touch markets of learners beyond traditional first time full time college freshmen (high school graduates) is particularly acute in metropolitan areas like Green Bay and much of our focus on the future will have to be on these markets using technology. As we meet this challenge, we must fully accommodate the rapidly emerging technology needs of the Green Bay economy particularly in health care and manufacturing. Career as entrepreneurialism – Traditional views of career do not serve our students who will enter a fully globalized economy even if they stay in Green Bay and are expected to hold many more jobs through their lifetime than previous generations. We are also preparing students for many jobs that do not yet exist using technology only now emerging. One of the greatest advantages we have at UWGB is our interdisciplinary approach which we believe can serve as a model for the development of the kind of nimble intellectual range that will be required of the workforce of the future. State divestment and regulation- Of course we are working to build for the future without the support of traditional partners in public higher education and within an unusually highly regulated higher education environment. Economic changes – As I will show, the economy of this region has changed dramatically in the past 50 years and will continue to change. We must respond to these forces if we are to meet our obligation to be a key partner in the economic future of Wisconsin. Let me show you how things have changed and how those changes are related to these forces. The founders of UWGB expected that the new university would give Green Bay a chance to stay on track or exceed national and state trends in degree attainment. But beginning in 1990, degree attainment in the city of Green Bay diverged to a trajectory lower than that of the state, the nation and the surrounding county. This is the result of urbanization in the city of Green Bay and presents UWGB with a unique challenges and opportunities if we are to meet the educational and talent needs of this city and region. This community is fully aware of this challenge. The University is a major partner in one of the most impressive community-wide cradle to career efforts I’ve ever seen: Achieve Brown County. The community leader of this effort is Tim Weyenberg, former CEO of Foth, who serves as the Austin Cofrin School of Business Executive in Residence. Complementary to our participation in ABC, we have also joined with Northeast Wisconsin Technical College (NWTC) and the Green Bay Area Public Schools in an ambitious early college program called Turbo Charged which is an effort to provide early college to every student in the area. I reviewed this project this morning in the REDI Committee. Between 1960 and 2010, the percent of the population composed of those with underrepresented minority background increased thirty-fold in the City of Green Bay, a much greater increase than in Wisconsin as a whole. In the same time period the diversity in surrounding Brown County increased about as much as the rest of the state. This is kind of racial and economic stratification observed in other urban areas. There are a number of important dimensions of this diversity that this chart does not show. Green Bay has a large Huong population and a growing Hispanic population. We also have a long collaboration with the First Nations of Wisconsin. One of the first faculty members at UWGB – Cliff Abbott, a scholar from Yale – worked with the Oneida Nation to recover their written language. And, you may recall that this Board recently approved our first doctoral degree, an Ed.D. in First Nations Studies. The relationship between this diversification and educational background brings the UWGB challenge into sharp relief. Among adults 25 years and older in Green Bay, the level of degree attainment and the diversity is greater than other areas having comprehensive universities (three areas given her as examples). The type of diversification portends a situation more like Milwaukee than other university sites in the state. The demographic trends are reflected in the local school district, where we see the stratification that is common in urban areas. We can also get a glimpse of the future here. The number of underrepresented students in the Green Bay Area Public Schools is increasing. This presents UWGB the additional challenge of promoting access while managing the quality of higher education in accordance with BOR guidelines related to remediation, etc. There have also been significant changes in the regional economy since UWGB was founded. Manufacturing has increased but the region has experienced a decline in agriculture. The area has experienced significant increases in the health and service sector and professional arts and entertainment, much of the latter is related to the presence of the university and, more recently, the Green Bay Packers. All of these economic changes have increased the need for a highly educated work force and new social and commercial opportunities in the region. It for these reasons the Green Bay Packers are developing Titletown. The current economic configuration is one of the main reasons we sought your approval to reorganize the university into four colleges. We now align more closely with these sectors. Our response to the new realities of the urban challenge is to reorganize and to re-imagine our obligations to this community. We can no longer afford just to teach our students about how to solve problems. As an institution we must accept ownership of regional challenges and accept our part of the collective responsibility to solve them. We can no longer suggest how to expand social and commercial opportunity. We must be the key partner in making that happen. These imperatives necessarily extend us beyond our traditional academic mission. So, we need to change from what we have been to what few must be to meet the needs of this region. We must reshape. Unfortunately, because of reductions in state support and a freeze on tuition to accomplish this we must first reduce. The most important consequence of the loss of a commonwealth value of public higher education in America is the loss of the two most important and traditional partners: the state and students. To rehabilitate these partnerships should be the primary goal of the system. At UWGB we are doing our part through our Council of Trustees and partnerships with our education partners (both of which I discussed with the REDI committee this morning). Our response has been to examine ourselves and our environment closely, reorganize to align our programs with economic sectors, create a high level faculty and staff planning group (UPIC) and begin the process of revising the existing university strategic plan. Fortunately, we have important assets to bring to this challenge. One of the most important of those is our interdisciplinary core. We believe that the key to success in the global economy is the ability to integrate perspectives and create innovative solutions. For 50 years, this university has lived by that commitment. The most important asset we have is our faculty and staff. At UWGB, we are fortunate to have an extremely accomplished and productive faculty. Collectively the represent the most prestigious graduate schools in the country. They are superb teachers – 9 UWGB faculty have been recipients of the Regent’s Teaching Excellence Award. Our faculty includes internationally renowned scholars such as Harvey Kaye, Greg Aldrete, Heidi Sherman, Amy Wolf, Bob Howe, Sara Meredith and Kevin Fermanich to mention a few. New knowledge is the currency of the University: Last year the faculty published more than 150 peer reviewed articles, 15 books and participated in more than 130 exhibits and performances. They are productive scholars generating nearly $5 million in extramural funding each year. The commitment of the faculty and staff to a highly engaged university is demonstrated in the extensive volume of public service provided annually. Last year, members of the faculty and staff engaged in over 200 service projects in the Green Bay community and virtually every important board or community initiative includes participates from the faculty and staff at UWGB. Also key to our future success the level of research and scholarship focused on community needs. While as an enterprise American public higher education has lost the trust and support of key partners, UWGB enjoys enormous support in the Green Bay community. Here is a select number of key university partners. It is important to note that in the coming year the community will undertake a broad strategic planning process organized by the Greater Green Bay Chamber of Commerce. It is clear from our first meetings with the consultants from Austin, Texas that the future of the region depends on a fully engaged and aligned public university. We have other important assets. A beautiful campus much of which is designated as an arboretum. One of the finest performance halls in America. Division I athletics program which gives us positive exposure to major markets throughout the United States. The City of Green Bay and the surrounding communities. Proximity to one of the most beautiful vacation and recreation areas in America. The thing we are most proud of is our history of transforming the lives of students. Like our Provost, more than one half of our students come from families with no tradition of higher education. They are very successful here as these metrics demonstrate. I want to draw your attention to the Academic Excellence Symposium. Students participating in activity are displaying their research and scholarship on the floor below this meeting room during the Board of Regents meeting. I hope many of you will drop by and see this work. Some of these students will be at the Posters in the Rotunda event next week in Madison. But what we are proudest of is the way this university shapes student dreams into the success stories we see in our alumni. Here is a short video that connects the dreams of three current students with the successes of three local alumni. We are working through challenging times with our eye to the future. One of the biggest changes we have made is to reorganize ourselves to align with the local economy. This is the first step in building the partnerships that are required to serve this region. Each of these new colleges will have a major impact on Green Bay. I want to highlight one of those now. I have asked Dr. John Katers, the inaugural Dean of the College of Science and Technology to give you a preview of his vision for the future of that College. UW Green Bay’s continuous commitment to assist our veteran students with the transition from military service to the classroom has helped our campus attain the designation of Military Friendly for several years. A big part of this transition is educating our faculty, staff and students about veteran issues. In the past we have provided this training as part of the Inclusive Excellence program and new faculty training. Veterans face numerous challenges in the transition to civilian life. Veterans are almost 3 times as likely to commit suicide as civilians, and suicide rates among veterans that don’t enroll themselves in the Veteran Health Administration have increased by 60 percent over the last 4 years. We cannot truly empathize unless we are veterans ourselves, but we can strive to understand the unique value that veterans bring to UW-Green Bay and the community, bring awareness to support services available to veterans, and continue to work to destigmatize the need for help. UW System recently began the UW VETS certification, which is a designation given to veteran friendly campuses within UW System. One factor in the UW VETS certification process is faculty, staff and student training programs. To assist campuses with the certification process, UW System has recently adopted an online training program, Kognito: Veterans Awareness Training, aimed at teaching faculty, staff and students how to identify signs of distress, approach a student they are worried about, and refer them to services available on campus and within the community if needed. I encourage all faculty and staff to complete the Kognito training online. This training is available for students and can be used as a valuable tool within the classroom. If you would like to be more involved with veteran students on campus, visit the “At Ease” Veterans and Service Members Student Lounge located in MAC Hall 124. If you have questions, contact Veterans Services Coordinators, Elaina Koltz (koltze@uwgb.edu) or Jamee Haslam (haslamj@uwgb.edu) at 920-465-2075.